The Muckenthaler Cultural Center is the former estate home of Adella and Walter Muckenthaler, situated on a large lot that is elevated above Malvern Avenue. The main portion of the house is two stories in height, with one-story wings at both ends and a garage on the north side. The two-story portion, which includes a full basement, is an outstanding example of the Mediterranean variation of Spanish Colonial architecture. This remarkable complex of buildings is complimented by an interior atrium, a stone gazebo with tile roof at the southeast of the house, and a wood arbor on the west side. The grounds around the home are an important part of the property, including the layout of landscaping, walkways and driveways. The 7,600-sq.-ft. house along with its grounds is one of the most significant Orange County examples of Mediterranean residential architecture. The house's design was influenced by the 1915 Exposition in San Diego. The detailing of the two-story portion is exceptional, emphasized by the low-pitch tile roof, iron grill work, an octagonal solarium at the southeast corner with Palladian windows, the elaborate relief decoration around the main entry, and second floor balconies. Its reflection of an Italian villa is the result of trips taken by the Muckenthaler family to Europe, from where the impressive main interior staircase was imported. 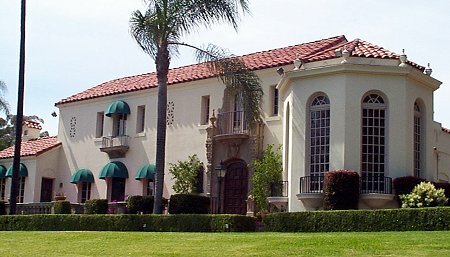 The architect was Frank Benchley, who designed many other significant structures in Fullerton, including the California Hotel, the Farmers and Merchants Bank, the second Masonic Temple, his father's Craftsman style home on Harbor Boulevard, and a well-preserved bungalow court on Pomona Avenue. The contractor, E. J. Herbert, also built the 1930 Santa Fe depot. In 1918, Walter Muckenthaler married Adella Kraemer, a daughter of the wealthy Kraemer family of Placentia. In the early 1920s he purchased 80 acres of property that was part of the large Carhart ranch. The property extended southward from where the mansion was built in 1923, to Commonwealth Avenue. The majority of the land was devoted to groves of lemons, avocados and walnuts. Walter Muckenthaler was a prominent person in the community. He served on the City Council and was very active in civic and business affairs from the 1930s through the 1950s. 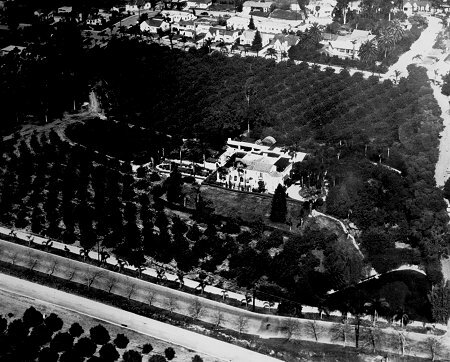 The 8.5-acre property where the house and its grounds are located was granted to the city in 1965, with the stipulation that it be used as a cultural center. Over the years a number of alterations have been made to the house to convert it to its specified use, but none has destroyed the original character-defining architecture. In the early 1990s, additional improvements were undertaken creating an outdoor stage and seating area on the south side of the house and a reception area along the west side. An adopted Master Plan for this property regulates and guides its future development.